How did early supermassive black holes form? It seems like every few weeks that we hear news of a new study of the early universe showing that black holes formed earlier than expected and that structure in the pattern of galaxies extends to larger distances than expected. The ruling paradigm says that galaxies formed when hydrogen gas and dark matter slowly clumped together under its gravitational pull. Stars were formed which continued to collapse togther to form galaxies. The early stars which were large would die quickly and form black holes which would coallesque to form supermassive black holes at the centres of galaxies. The process was seeded by density perturbations in the gas that existed at the time of last light scattering. The effects of these perturbations are seen in the cosmic microwave background and are very familiar to cosmologists. They are believed to be due to fluctuations during the inflationary epoch and they have the right scale invariant spectrum to fit that hypothesis. 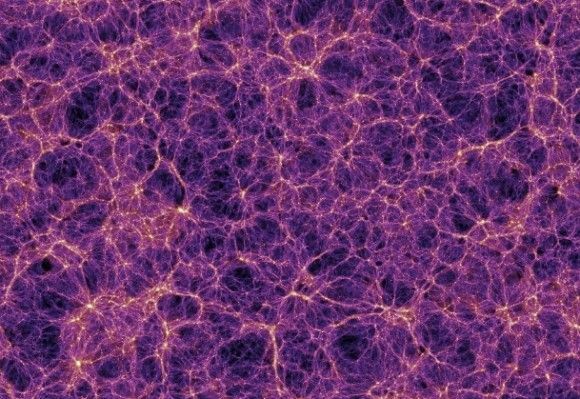 You can model the formation of galaxies and large scale galactic structure in cold dark matter models using computer simulations. With the right parameters set for the mass of dark matter particles you can get good agreement with observations. But the agreement is not good enough. It predicts that the black holes form after the stars, yet we see quasars appearing in the early universe containing huge black holes that must have formed much earlier. The latest example is a quasar with a mass of 2 billion suns observed at just 770 million years after the big bang by ESO’s Very Large Telescope. We have seen proto-galaxies and gamma ray bursts from even earlier. We also observe structure in the distribution of galaxies that extends out to very large scales. This is not predicted by the cold dark matter theory of structure formation. An example is the Great Sloan Wall, a vast planar structure covering 5% of the size of the observable universe. Up to these scales the distribution of galaxies forms clusters and filaments as well as voids separated by these walls. How could these have formed so soon and so big? One possible answer is that they did not form through gravitational collapse at all, but instead by a process of caustic focusing of dark matter by gravitational waves. Let me explain. We know very little about how the inflationary epoch ended. The vacuum state would have changed as the inflationary scalar field dropped into a broken phase. There may have been a phase transition but it may have been a soft second order transition or even a smooth crossover. We don’t even know when it happened. It may have been the elctro-weak transition or something earlier. With new physics from the LHC we may be able to work out how it happened. It is likely that the transition did not happen simultaneously at all points in space. Fluctuations would mean that inflation continued a little longer in some places than others. This would leave a remnant gravitational wave background in the universe which in time would have cooled and weakened as the universe expanded more slowly. It would be hard to detect directly today because of its very low frequency and weak amplitude, but in the early universe during baryogenesis it would have been stronger. 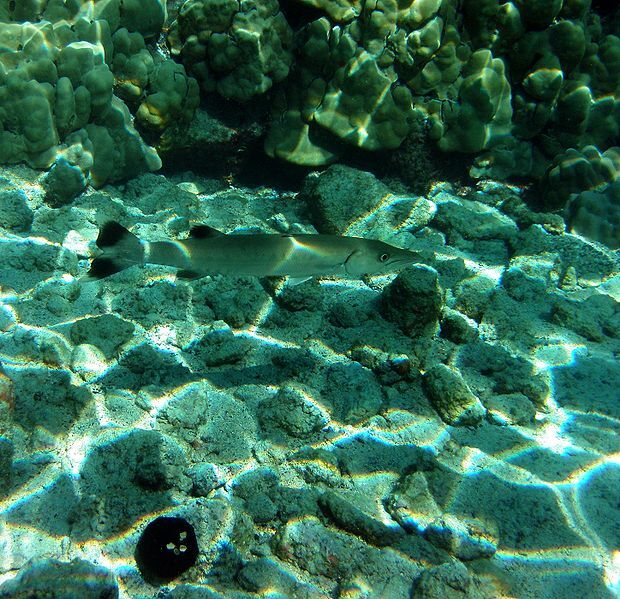 The effect on baryonic matter would however have been washed out by electromagnetic forces acting more strongly than anything these waves could do. Dark matter on the other hand is uncharged and only interacts weakly. The gravitational waves, if strong enough could have influenced the distribution of dark matter. This is more true if dark matter particles are heavy so that they move more slowly at a given temperature. So what would happen? In fact heavy particles would follow geodesics through the gravitational waves which would focus them onto caustic surfaces. The process is very similar to the focusing of light through the waves on the surface of the sea of a swimming pool creating familiar patterns of light on the bottom. The caustic lines are replaced with surfaces stretching across the universe just like the ones seen in the Sloan Survey. Where the walls meet even denser concentraions of matter would form. Caustic light patterns formed by water waves quickly shift to disappear and reform elsewhere, but when enough dark matter is concentrated into one place it will itself gravitate and form dark stars or black holes which lock in the pattern. This could have happened very early in the universe, possibly even before the cosmic radiation background last scattered off hot baryonic matter. The ordinary stars would form around these structures either by gravitational attraction or due to the pressure of radiation from dark stars and gas falling into the black holes. Either way the structure in the distribution of galaxies would be largely determined by the caustic patterns provided by the gravitational waves so it can extend much further depending on the spectrum of the waves at large wavelengths. The large black holes that form quasars would originate from concentrations of dark matter at the densest points where the caustic planes meet. This entry was posted on Saturday, July 2nd, 2011 at 9:26 am and is filed under Cosmology. You can follow any responses to this entry through the RSS 2.0 feed. Both comments and pings are currently closed. 23 Responses to How did early supermassive black holes form? To my view the problems are due to the stubborn sticking to the belief that no structures were present during primordial period. In TGD Universe primordial period was dominated by long cosmic strings (not same objects as in gauge theories! ), which in ideal situation are surfaces of form X^3 xY^2 in M^4xCP_2 having 2-D Minkowski space projection and look like strings in Minkowski space. Later space-time sheets and nearly Minkowskian space-time emerged as the Minkowski space projections of cosmic strings became gradually wider. They would be also responsible for the magnetic fields permeating the Universe. Also this is very difficult to understand in standard dogmatics. All structures were formed from these primordial cosmic strings in TGD Universe. Galaxies- themselves decay remnants of shorter cosmic strings- would be like pearls in necklace around long cosmic strings would which explain their grouping to linear structures. Fractal spaghetti would be a good description for the situation. The burning of cosmic strings to particles could explain quasars and also cosmic strings could give rise to blackhole like objects which are however different from blackholes of GRT inside the horizon. 1/rho gravitational field associated with the long strings: no need for MOND, no need for complex models producing mass distributions guaranteeing this. The testable signature is free motion along these strings not predicted by other models. Systematic motions in quite too length scales have been indeed observed. The predicted cylindrical symmetry of galaxies fits also nicely with their planar geometry. But as noticed in the posting: they must reinvent this themselves. There is no hope about penetrating the communication barrier. They read only articles with citations written by people with academic position. Sorry for typo: X^2xY^2 was intended instead of X^3xY^2. The Conclusion, could be that the Big bang is the successor of a Big crunch as an important moment in a cyclic multiverse, based on new paradigms for Fermion repelling and splitting black holes (dark matter), a new standard particle model and a dense microscopic oscillating Higgs-alike vacuum. According to Quantum FFF theory however the last conclusion could be different. A Support for the Big Bang as a splitting giant Black Hole. Sigh. Of course Louise has been saying this for years and years, duh. I realize that it is hard to cope with fermion repelling and plasma producing horizons of black holes. Splitting and pairing and plasma producing black holes, in The Eagle Nebula, Cygnus-A and even in the early universe, look at the images yourself at my Vixra letters and Blog.. This is a nice idea. I am working with Corda on the gravity waves with much this sort of physics. Gravitons produced in the early inflationary universe become long wavelength gravity waves which perturb the homogeneous structure of the universe. These early gravity waves are the dominant gravitational process on a large scale and these results in this sort of geodesic caustic formation of radiation and matter in the universe in its post-inflationary phase. Phil, I fail to see how you can seriously attribute primordial BHs to perturbative ideas like NON EXISTENT gravitational waves. Louise’s infinite c theory is infinitely simpler, and it predicted this observational reality. And it fits nicely into holographic M theory, when done right. Why make things more complicated than they need to be? The solution I am proposing for the formation of black holes and large scale structure is relatively conventional. I assume that GR, dark matter, dark energy, inflation, gravitational waves etc are all correct. It is just ΛCDM that I am casting doubts on. As I understand it, Louise’s theories assume that all of these are wrong. Perhaps I am being too conservative to look for solutions which stick with such mainstream ideas that are supported by strong observational evidence but if throwing all that away is “simpler” then simplicity is not my taste. However I sincerely wish you the best of luck in showing how it all works. I am presuming that in the ΛCDM the part being challenged is the nature of curvature fluctuations. Dark energy plus dark matter plus baryon density, opacity of radiation dominate period, curvature fluctuation and so forth constitutes ΛCDM. The density fluctuations may then be modulated by the production of gravity waves, which with the onset of inflation have been expanded to enormous wavelengths. However, maybe the caustics or matter-energy focusing they permitted remains. Back in 2009 I was asked to look at Louise’s theory, and it does not take much to dismiss this. It is basically a variation on the speed of light idea. The idea is a curious variant on the Schwarzschild radius GM/c^3 = t, which is half the time it takes light to travel half a Schwarzschild radius in flat space. The GM is constant and so as time increases the speed of light must decrease. This is presumed to explain the inflationary period, or to replace that theory. What is wrong with this idea? It is not hard to show that if you take the range of physical formula and adjust c, then all of them would adjust in such as way that nothing changes. For instance the Bohr radius would change, so the size of atoms would change, which means meter sticks would change their lengths. The change in these length scales would completely cancel out any apparent change in the speed of light. We might ask why the speed of light has the value it has. This is because of other coupling constants which determine the strength of forces, and as well due to the sort of units we chose at the start of physics. I cringe whenever I see theories that involve the change in the speed of light. I have a real working time machine in my basement. Sometimes when there is nothing on TV to watch, I go downstairs and move myself into the future. This, despite one small drawback in the present design – it moves the entire universe into the future with me by exactly the same amount. So that unfortunately there is never any apparent difference. That is one way of looking at it. We are all moving forwards into the future at the speed of light, and if the speed of light were to dramatically increase then we and everything else would be moving into the future at the same rate. No change could ever be recorded. I find the evidence for GR convincing and within GR a changing light of speed does not make much sense. You can vary dimensionless parameters like the fine structure constant but that is better interpreted as a change of electric charge or other coupling constants. It would affect chemistry and nuclear physics in ways that need to be reconciled with experiment. I made these points in the physics FAQ . A more detailed paper by Duff is excellent. See also the papers citing it. It may still be possible to construct a varying light speed theory but you would have to show how the field theory works beyond GR and address all the other objections. It is no small task and I wish good luck to anyone brave enough to try it. I am also curious about the no-gravitational radiation stance. If you take general relativity to the post-post Newtonian level it is similar to Maxwell’s theory. Gravity waves exist for the same reason that Maxwell posited the displacement current in EM. Of course gravity waves will be hard to detect, for gravity couples to matter weakly and the higher order GR terms for a basic gravity wave will be very weak. Yet, they must still be there. I would be happy to have a good argument for why gravitational waves are non-existent. I have probably missed the arguments showing how Louise’s theory produces observational reality. I remember however the experimental finding that inspired Louise. It has been found that the time taken for a light signal to travel to Moon and back changes with time. Does c change? Or does the distance of Moon change? Or is something more delicate involved so that the measurement is somehow wrong? I remember also my own demonstration for how the reduction of the effective light-velocity at space-time sheets (the path is longer along curved surface rather than along geodesic of imbedding space) predicts correctly the effect. *The change of c is only apparent and due to the fact that the time unit used for the measurements in Earth-Moon system corresponds to the time defined by distant stars being determined by R-W metric in good approximation. *If one erratically identifies this cosmic time with the local M^4 time one obtains that the time used for travel forth and back changes with time. * At quantitative level the phenomenon reduces to the deviation of the time component of Robertson-Walker metric from unity which indeed depends on the local Minkowski time. This explanation does not make sense in GRT context: it is absolutely essential that space-time is 4-D surface of M^4xCP_2 so that the effect can be seen as direct experimental proof of TGD. The effect also makes possible a precise measurement of the value of the time-time component of R-W metric, something totally new. The change of c predicted by Loiuise’s theory leads also to catastrophic predictions in early cosmology to say nothing about basic formulas of physics like E=mc^2 predicting that particles would would have infinite energy in very early cosmology. Also formulas containing c -say the formula for fine structure constant- produce complete nonsense. Louise’s cosmology is also inconsistent with general coordinate invariance. Why don’t you, Kea, talk for a while? A straight gravity wave is infinity? By listening one learns, Kea;-). Sorry to play the party pooper here, but while there may very well be things we don’t understand about structure formation at high redshift, it’s unlikely that quasar counts at high z will persuade people to abandon CDM (the dark energy not being very relevant here). There are simply too many astrophysical uncertainties, and they’re not small effects. To recap, we know that most of the mass of these very massive black holes is not primordial, but was gained by accreting gas. 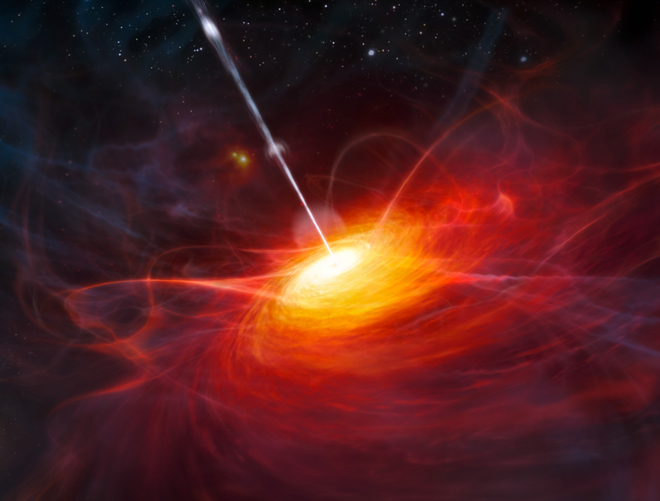 The evidence comes from the fact that the integrated luminosity observed from quasars and AGN roughly matches the local space density of massive black holes, once one applies an efficiency factor for the conversion of rest mass to radiation as gas is swallowed (the “Soltan argument”). When one observes a high z quasar, then, the potential problem is not how to form a 2 billion Solar mass object at once, but rather whether there’s enough time to form a smaller black hole earlier on, and have it grow by a large enough factor by the time it’s observed. Jokes aside, the point here isn’t that we understand supermassive black hole formation very well, or that CDM might not be wrong. Only that we don’t understand black hole formation anything like well enough to draw robust conclusions about CDM. Phil, thank you, it is good to have an expert opinion. Of course it is possible that your quasistar theory could be the answer to the early formation of black holes and it is just a little less radical than caustic focusing of dark matter from gravitational waves. It could also be that the theory is not being taken seriously enough and you really cant get round these limits without a new physical process. Presumably there will be more data from future observatories such as Webb and Planck so this is going to be an interesting story to follow. What about the large scale structures such as the Sloan Wall? Are there any good theories for that? Phil – I’m by no means a cosmologist, but my impression is that on large (linear) scales there are no current observations that are significantly at variance with the standard cosmological model (lambda CDM, so collisionless cold dark matter, time independent dark energy). The observations this model fits include the existing microwave background results, and galaxy redshift surveys such as Sloan. There is reasonable evidence (3 sigma or so) for a deviation from a scale-invariant spectrum of primordial perturbations, which is generally taken seriously, and various claims for odd structure on large scales in the CMB, which most people think are not very significant. Areas where the standard model seems more vulnerable are on small scales: black hole formation at high red shift, and the abundance of galactic satellites around the Milky Way, for example. These are all areas where more complex non-linear effects are important: gas physics, star formation, feedback from supernova explosions… the list goes on. So there’s some tension between a “conservative” interpretation, which attributes any discrepancies between theory / observation to poor understanding of the astrophysics, and the more “exciting” possibility that discrepancies point to failures of the underlying cosmology. As you say, the next major test will be to see if Planck results remain consistent with the model! Future observation of very distant celestial object will continue to prove black hole theory to be irresponsible, and also prove established conceptions to be incomplete. It is very important to note that the all established conceptions are based on an assumption that Newton’s law of universal gravitation is correct. But if not, how do we understand these observations ? So, please take some time to carefully check whether the argument of universal gravitation is correct or not. I early posted here a paper to describe the structure of the universe and the movements of celestial objects, but it seems like few people have a look at it. By simply tweaking the cosmological model of Roland Omnes it is possible to remove the principal objections to it, and at the same time account for observations of supermassive black holes which indicate they were created earlier than seems reasonable.